Finally made some progress on the first four parts of the On Ringo Lake Mystery. All of the Part 1 9 patches are made, and some of parts 2-4. I’ll be working on catching up when I start my vacation Thursday. The fabric for this one is completely from stash. Link back to Monday’s Link up. Top put together and metered borders added on our first day here at Shipshewana. This is Jinny Beyer’s Mystery for this year. 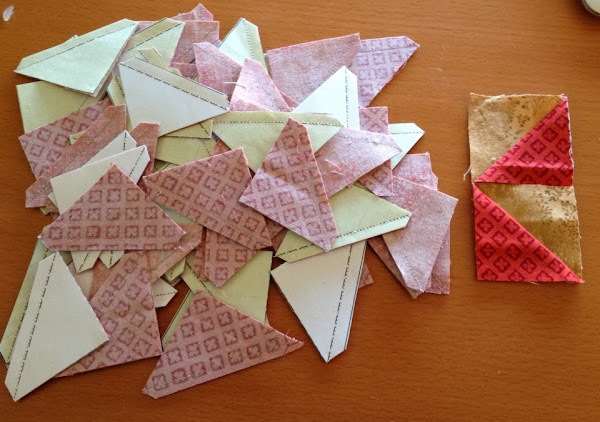 Since I’m using one tan for my yellow and only a couple of oranges, I decided to make my HSTs using the printed templates and strips of fabric. I had 64 sewn and sliced in less than an hour. I’ll pull the papers off in front of the TV this week and press them open. And make 136 more. But this weekend was busy finishing up Christmas Gifts. Linking to Bonnie’s Part 3 post. Just took a look at Part 2 of Celtic Solstice Mystery. After all the units like these I just made for Lazy Sunday, I am not looking forward to making more of these. Why can’t these be strip pieced? The answer: They can! Sew together the three strips with the green in the middle. Then cut the strip sets at a 45 degree angle, some in both directions to get opposing chevron pieces. Cut your 45 degree angle slices every 2″ to get the right width. I used my 3.5″ square to measure the 2″ inches and I line up the 45 degree mark on my 6 x 12 inch ruler with one of the green/tan or green/cream seams for accuracy. Then line up your 3.5″ ruler with the side and the two green points. Slice off the excess tan and cream and you have a perfect 2″ x 3.5″ unit. Sew together and press the seam open. A perfect 3.5″ square. I still have waste triangles of the tan and cream, but no waste green triangles. So I figure I’m saving some amount of fabric and loads of time with this method. My waste triangles are now in my box for the Wild and Goosey paper pieced blocks. To save even more time, take two strip sets and press seams in opposing directions as Bonnie suggests. Then sandwich the strip sets together before you slice on the diagonal. Then you can slice the opposing directions all at once. Trim by lining up your 3.5″ ruler on the 2″ mark at the end of each seam line where the points form, and you’ll have your units nested together all ready to sew. Tried this again today and it works perfectly to get your 3.5″ chevron unit with no trimming required. I’ve added a link to a printable version of this post here. I’ll hook this up to Bonnie’s Monday Progress post when it goes live. PS: Someone asked about the border units for Lazy Sunday. Use three 2″ strips, cut diagonally at 2.5″ wide and it works. I’ve officially started this year’s Quiltville mystery. I’ve made some of the blue/orange units. I’m taking it slow this year. My colors are more muted than Bonnie’s but still blue, burnt orange, dark green, and a wheat tan/yellow. This one is for me. Hooking up to Bonnie’s Monday Linkup. Well, I never got around to posting goals for August so I’ll have to comment on my July goals. 1. Finish the Caroler Table Runner. My UFO number 8 for this month. 2. Pull fabrics for my Shipsie project. Muffet has challenged me since she has her fabrics pulled already. Done. And the first part of the binding is sewn down. Working on the hand sewing now. 4. Bind Christmas Quilt that I just finished hand quilting. Well, the binding is sewed down but the hand sewing still needs to be done. Finish hand sewing binding on Monster Bash. Cut and prep fabrics for Shipshewana. These should be easy enough. Linking up to Judy’s post a little late. 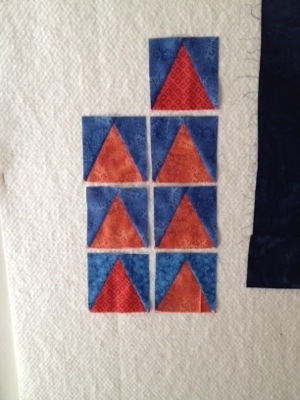 On my design wall today are some of the blocks partially sew together for my Lazy Sunday mystery top. 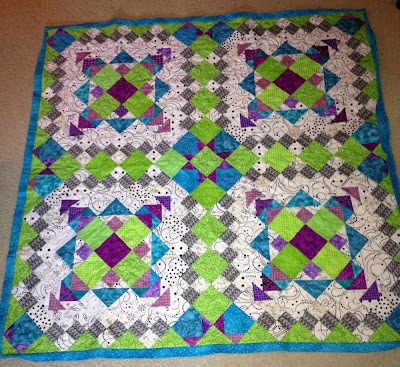 I didn’t make all the blocks called for so my quilt will be a bit smaller. One more row to add on the bottom and then the border pieces. Linking to Judy’s Design Wall Monday post. I’m getting this post written early since I’ll be on vacation from tomorrow until the end of the month. I made great progress this past weekend on my four goals for June. 1. Finish hand quilting the Christmas quilt. The top is done; ready to find a backing and quilt it. Done. Last stitch in the binding was done Thursday, the 20th. Haven’t thought what I want my goals for July to be yet. I’ll figure those out and post about it on July 1st when I return. This week I quilted and bound my version of Roll Roll Cotton Boll. I say blue in the title because I have a pink one in the works as well. This makes 10 finishes for the year, and it’s only April. 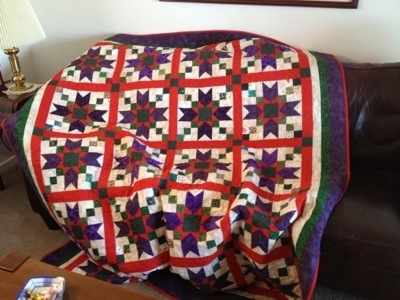 This quilt is also number 1 on my UFO Challenge list which should have been completed in March. But better late than not at all. All the fabric is completely from Stash. No new purchases to complete this one. Note even batting. It was pieced from leftovers too. This top took a long time to finish because I really didn’t like the neutral string alternate block. I got the inspiration for the alternate block I chose from the Quiltville Yahoo Group photos. I really like how this turned out and it already has a home. See previous blog posts about this quilt here. 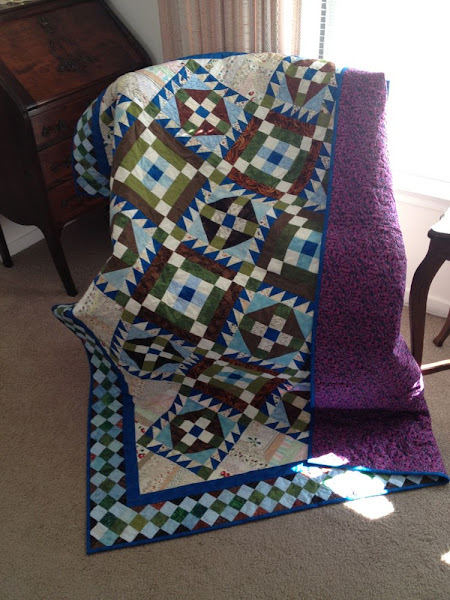 Linking up to Crazy Mom Quilts Finish it up Friday. Finished the top and I’ve got the borders ready to add. Use up the leftover Easy Street units. 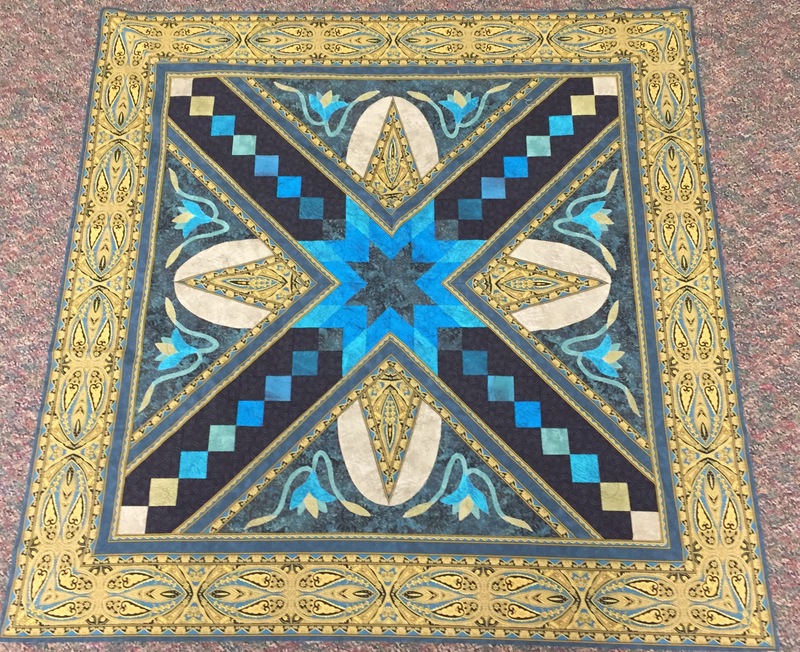 Made a mini-Easy Street quilt 45″ square from the leftovers. This quilt is now just waiting for the binding to be hand sewn down next weekend on a road trip. Sandwich Double Delight ready for quilting. Had a fun time sandwiching this quilt using the island in my son’s kitchen. I’ve found my new sandwiching “table”. This quilt is finally all ready to quilt. Make Orca Bay border units. Somehow I turned this goal into making the border units for my Blue Roll Roll Cotton Boll instead. Well at least it’s progress on a UFO. In addition this month, I quilted six quilts finishing three by machine stitching the binding. The other three will be hand stitched next weekend. Not a bad month. Look here at what others have accomplished.